Does the vacuum brake booster have gaskets on both ends? I don't see a listing for just the gaskets at Autozone, and my repair manuals are in a box somewhere. If it has them, what's the material? Trying not to rip into a project without all the parts to finish it. Seems I have a vacuum leak at the booster, but where exactly is the sticking point. 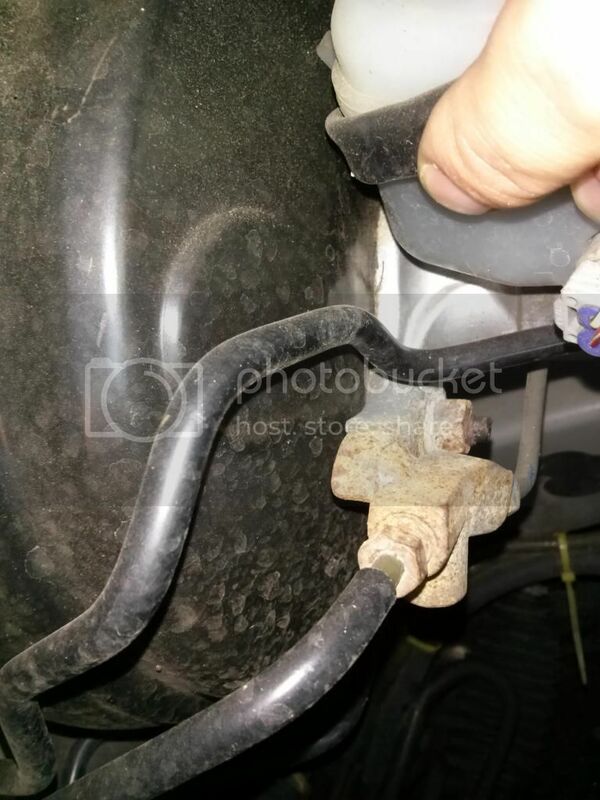 I think I porked up a gasket by leaning on the master cylinder, but I'm stuck there. I'll post up a picture for you tomorrow of the gasket. You could order it from Toyota for a few dollars. It's a thin paper-like gasket. If you change it and the hissing/vacuum leak continues, you need another brake booster. Change the gasket first because that's easy and cheap. Good luck. Cool. Thanks for the info. I have the other car to raid for parts if nessary, but based on your info its not a reusable gasket set, so I'll need that regardless. Make sure they're compatible. The SLE has a different brake booster because it has the traction control otherwise they should all be the same, regardless of transmission type. 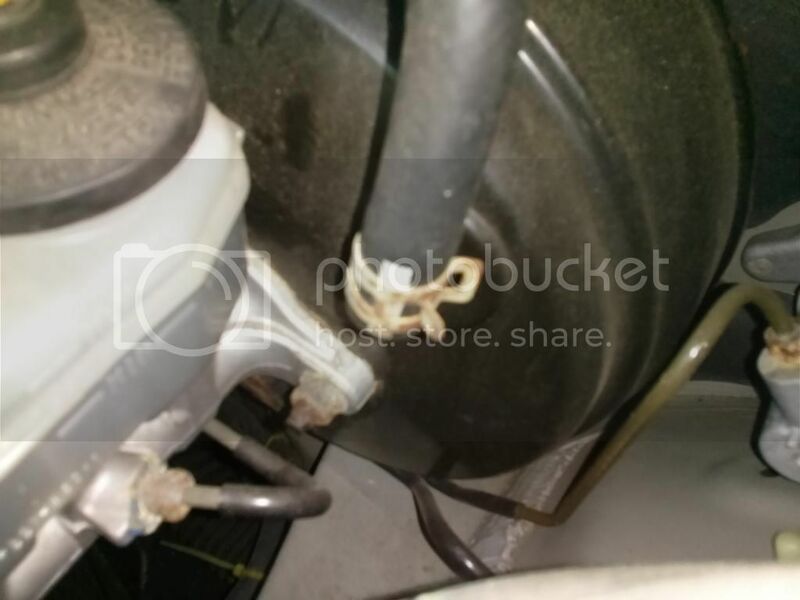 Its pretty hard to see but the gasket but its between the brake booster (black rounded bowl) and the alloy part thats held on by 2 nuts. I'm trying to explain this in the easiest form so you could understand so excuse me upfront if you're well versed in the parts names, functionality, etc. btw, havent seen you on the forums in a while. Good to see some OG's still have their Solara. Actually this is a "new" one. Had a tornado drop a tree on my other one a few years ago and I had some pretty serious health problems, so I've been biding my time, getting healthy, and waiting for the right deal to fall into my lap. Anyway I scored this one with only 110k miles for $2500, it's a bit rough, but I've got the old car still (caved roof and all), so donor parts are pretty easy to come by. Thanks for posting the pictures, as I still haven't had time to dig out my repair manual, or figure out where to even start the digging . Is the other gasket between the firewall and the booster? I get the simple explanation stuff, as there are a lot of kids kicking around the forums these days. For what it's worth, I have my A5, from when I turned wrenches, but I've not ever done a Toyota brake booster, and I didn't just want to jump in blind. In fact I'm not sure I've ever seen one fail on a Toyota, which is why I am guessing gaskets. I did notice, about the same time I saw your earlier note; that the part numbers are different for the SLE booster. If the gaskets don't get it, I'll take it to the shop I used to work in and smoke it, as the booster is pretty costly. Fortunately, I'm not cornered by necessity on this one like I would have been a decade ago, but sadly I only get to play with it on the weekends, as work, school, and family concerns pretty much eat my weekdays. Thanks again and have a good weekend! I finally got around to getting the booster done. I was able to hunt down a salvage yard pull for $30. It took about 45 minutes initially and I was able to remove the booster without disconnecting any hydraulics. I did miss the adjustment on the brake rod on the first go, but got it on the second. For this reason; if you're doing this job go ahead and get an extra gasket. They're only around a dollar at Toyota. Everything is working great now, and it actually ending up being a quicker job than I had expected. Also, thanks for the pictures Speedy!